Adult ADHD – Boon or Bust? Posted on October 23, 2015 | Comments Off on Adult ADHD – Boon or Bust? Defined as Attention Deficit Hyperactivity Disorder, ADHD is generally marked by hyperactivity, inattentiveness, distractibility and impulsiveness. The majority of those diagnosed with ADHD are children and, more often than not, boys are diagnosed at a higher rate than girls. Statistics show that a youngster diagnosed with ADHD will often carry that diagnosis into adulthood and many will continue to be treated throughout their adult lives. Those who are not diagnosed in childhood are likely to remain undiagnosed in adulthood. Even when behaviors such as restlessness, distractibility, procrastination and the inability to focus persist, many adults do not recognize the symptoms of ADHD. Although hyperactivity often diminishes in adulthood, inattentiveness and impulsivity generally endure. Adults with ADHD are more likely to have an anxiety disorder or suffer from depression. While procrastination, inability to concentrate, forgetfulness, disorganization, difficulty completing tasks and distractibility are commonly seen as negative symptoms of ADHD, some highly successful business entrepreneurs who have been diagnosed with ADHD feel that certain symptoms of ADHD have actually contributed to their success. According to psychiatrist Dr. Dale Archer, “characteristics such as creativity, multi-tasking, risk-taking, high energy and resilience are, in fact, strengths when leveraged in the right way and in the right career.” Adults and children with ADHD often have a low boredom threshold and become easily frustrated with routine. Entrepreneurs leverage this to their advantage, leading to an ability to function well in crisis mode, an ability to multi-task, the ability to hyper-focus on something they find innately interesting and the tendency to think outside-the-box to find simple solutions to complex tasks. These highly successful people say they recognize their shortcomings and so surround themselves with people who can focus on completing the daily details, enabling them to concentrate on the big picture. Many undiagnosed adults know they have trouble focusing, prioritizing and controlling impulses but are unaware that ADHD may be behind their impatience, forgetfulness and the inability to get their everyday lives together. Inattentiveness, or what some describe as an “underpowered state of consciousness,” affects the brain’s ability to effectively store a memory and can result in a constant state of frustration and seemingly endless searches for lost or misplaced items, forgotten appointments and missed deadlines. Impulsiveness can have unexpected consequences and disorganization creates regular challenges. However, it appears it’s the inability to focus, the core feature of the disorder, that has the most potential to wreak havoc on long term success and happiness. Not all of us are destined to become entrepreneurs or have a staff that can complete our tasks for us, but we can use some of their techniques to our advantage. The use of technology, which has become a distraction for far too many of us, can make life easier for those with ADHD. As people with ADHD tend to be creative, they can easily become distracted by their constant flow of ideas and creative energy. Taking note of these ideas as they happen and storing them in an online file or a notebook for later review can help to keep people focused on the task at hand. For those who tend to hyper-focus and become so involved in a task that they ignore everything else around them, setting an alarm as a reminder to limit the time spent on certain tasks allows them to move on to the next critical item. As many of us are aware, a lot of things get done at the last minute when the pressure is on. Setting a false deadline creates high pressure situations that produce dopamine, which enhances focus and feeds the reward centers in the brain, helping to get the work done on time. People with ADHD who seek jobs that allow for curiosity, creativity and brainstorming can put their flexibility and quick thinking skills to good use. In the right circumstances or environment, ADHD traits can become an asset and may give people an edge over other less creative thinkers. For adults with symptoms of ADHD, recognizing the cause of their challenges is the first step towards managing the condition. Many can learn to compensate for their areas of weakness and begin to capitalize on their strengths. It’s not about willpower, as ADHD is essentially the result of chemical imbalances in the brain. While life can at times be challenging for all us, when those with ADHD begin to identity problem areas, such as constant tardiness, forgetfulness, impulsiveness or disorganization, they can work to overcome these obstacles and use their creativity to their own advantage to lead interesting, creative and productive lives. If the inability to manage daily life cannot be overcome by self-help efforts, it may be time to seek outside, professional support. Attencia™ by Metagenics – Attencia™ is scientifically formulated to promote attention and focus with a unique proprietary blend of cognition enhancing targeted ingredients. Gluten free, Non-GMO formulation. 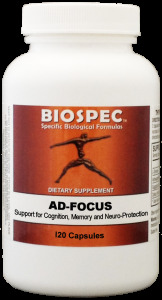 AD-Focus by Biospec Nutritionals – This broad spectrum, highly specialized nutraceutical complex contains vitamins, minerals, botanicals and adaptogens in support of cognitive function, memory retention and retrieval and neurological function. Gluten free, Non-GMO formulation. 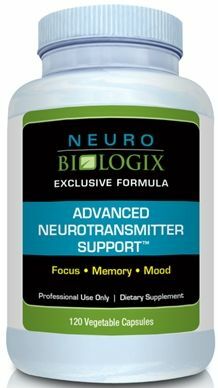 Advanced Neurotransmitter by Neurobiologix – This exclusive formula is specifically designed for ADD/ADHD neurological support. 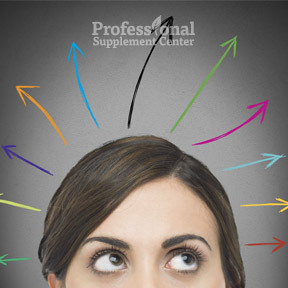 This product assists dopamine function and may help to improve focus, memory and mood. Gluten, dairy and soy free. Full Focus+ by Neurobiologix – Full Focus+ is carefully formulated with synergistic ingredients in support of improved attention and concentration, stabilized behavior and for support of methylation processes. → If you are pregnant, nursing, taking medication or have a medical condition, please consult with your healthcare provider before starting on any new supplement regime. This entry was posted in Home and tagged AD-Focus by Biospec Nutritionals, Adult ADHD, Advanced Neurotransmitter by Neurobiologix, Attencia™ by Metagenics, Full Focus+ by Neurobiologix. Bookmark the permalink.